Let’s talk a little more about what activities we have to keep our kids busy so we can listen as much as possible. Nothing is foolproof, but this helps so much. During conference, you can expect to hear from the Quorum of the 12 Apostles, plus the First Presidency. So this means there will be at least 15 speakers that you can count on every time. We correlate our activities to each of those known speakers. There are a lot of other people who also give talks, but the kids are usually still busy doing one of the past activities during those, so we don’t have to entertain differently for every single speaker. One fun thing we like to do is set up a little tent in the living room. We stuff it with pillows and blankets, and the little ones love playing in there. Look at the shelf in the picture above. The buckets on the bottom two rows are each for a different apostle. I have them numbered and each number corresponds with an apostle. So when they come up to speak, we do the bucket for that speaker. The kids love it. Some of the things in our buckets are magnetic darts, paint, play dough, puzzles, hole punch game, magnet challenge, ping pong ball toss (into cups labeled with different words- when they say the word, you toss the ball in), paper airplanes, snacks, and lots more. Luckily I got this prepared a few years ago, so now the set up is really easy because it’s just in a box in my closet ready to go- except for the snacks. We try to make everything something that can be done quietly and try to tie it in somehow to watching conference. But the deal is, you can’t get another bucket out until the last activity is put away. Otherwise things could get crazy really fast! 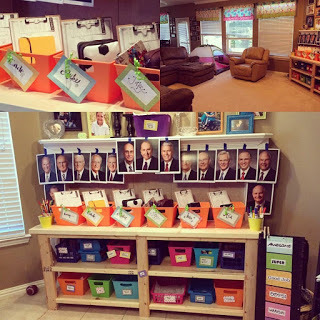 Also each child has their own bucket filled with different coloring sheets, conference notebook, conference bingo (there are tons of great printables on lds.org), markers, crayons, etc. We try to have special meals, and always cinnamon rolls. It’s become a really fun family tradition, and my kids have grown to love General Conference. I hope as they get older they will look back on it with fondness and want to watch for the spiritual benefits and not just the entertainment. These activities have really helped keep the kids busy so my husband and I can soak in the word of the Lord.